Aging is a natural physiological process. When a friend asks you, "What's your age?". He/she meant your chronological age. Chronological age is year count from your birth date. Most health conscious people, however, more concern about biological age. Biological age is biological changes in the body after its maturity. Such changes range from those affecting its cells and their functions to that of the whole body. Higher blood sugar level, higher cholesterol levels, high blood pressure, drop in hormone levels, lower energy capacity, lower metabolic rate, inclination of lean muscle mass and strength are examples or signs for biological aging. It is aging of our internal organs and body systems. Some parts of human body started to age after age 25. THE CODES OF AGING LIE IN OUR DNA. In 1961, Leonard Hayflick discovered that human cells divide for a limited number of times. This explain how human body age. WHY DO OUR CELLS STOP DIVIDING? In 1971, a Russian Scientist, Alexei Olovnikov, suggested that DNA sequences at the tips of chromosome (telomeres) would be lost in every cell division until they reached a critical level, at which point cell division would stop. 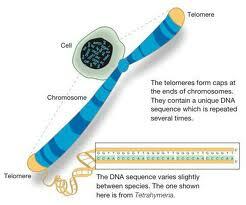 Telomeres are protein-DNA complexes localized at the ends of our chromosomes, with genetic code TTAGGG. 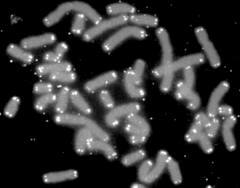 Telomeres keep chromosomes protected. In 1985, Elizabeth Blackburn, an Australian-born U.S. biologist, found that RNA active enzyme calledTelomerase can increase telomeres length. She and two others scientists were awarded with Noble Prize 2009 in Physiology and Medicine for their research on anti-aging and telomerase. Lengthening telomeres can help us in anti-aging and even prevent and reverse aging problems and diseases. So the Scientific Strategy: Anti Aging is to preserve telomere length and to boost telomerase activity. Fresh queen bee's colostrums, much more potent than most royal jelly, is a rich source and a powerhouse of nucleic acids (RNA and DNA that help in lengthening the telomeres), enzymes, vitamins (A, B complex, C, D and E), minerals (magnesium, calcium, potassium, zinc and manganese), all 8 essential amino acids, essential fatty acids, phosphorus compounds (including acetylcholine, the neurotransmitter) and gelatin (a precursor of collagen that helps to keep their skin looking smooth and youthful). For easy consumption, the fresh queen bee's colostrums is now made into tablets, the ST Factor. Other factors of aging: Free radicals activities, gradual reduction of hormones, microcirculation blockage and immunity recession. In the making of ST Factor, the process of extracting the colostrums is tedious and time consuming. 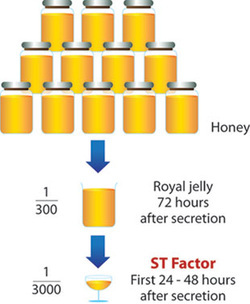 The colostrums must be extracted within 24~48 hours of queen bee's secretion due to its exponential loss of effects posr-48 hours of secretion.With the incorporation of BioTRATM technology, ST Factor works its magic in the body by releasing its active ingredients to the body, awakening and activating hormones of the body. 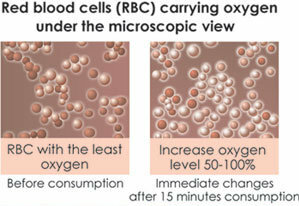 Within 15 minutes of consumption, the microcirculation system improves, giving energy to the body. Due to its many phenomenal functions, “ST Factor” is described as a youth essence. Telomerase, an active enzyme that boost cells rejuvenation by lengthening telomeres, therefore allows cells to reproduce continuously. 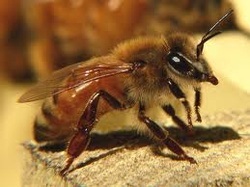 Studies have shown that telomerase of honey bees is very similar to that of human(Research article). No wonder queen bee's colostrums is so effective in anti-aging and royal jelly was called "Nature's Fountain of Youth" since thousands years ago. Genetic materials - RNA (ribonucleic acid), the telomeres building meterials. Natural Hormones -. Activate body hormones, stimulates production of hormones especially steroid hormones such as astrogen and testosterone; prevent impotency and promote sexual vitality. Improve the menopause phenomenon and delay the menopause period. Help to build lean muscle mass and increase metabolisme; Reduce fatigue, tiredness and other weak body conditions; Making skin moisten and hydrated and giving it a smooth and healthy texture. Aid body shaping, slimming and firming. Proline - It reduces the loss of collagen through the aging process. Proline and its derivatives form important components in collagen. Together with 10-HDA , our body cells are stimulated to produce collagen that make soft, smooth and elastic skin surface. This effect can be observed after continuous consumption of ST Factor for 10 consecutive days. Globulin - Build components in our immune system, such as immunoglobulin, antitoxin, antibody. Free Fatty Acid, Vitamins (A, B complex, C, D, E) & Minerals (magnesium, calcium, potassium, zinc and manganese), etc. •Control glucose level, prevent and improve diabetic problems.•Effective rectify high blood cholesterols.•Skin moisten and hydrated and giving it a smooth and healthy texture•Natural hormone regeneration•Aid body shaping, slimming and firming.•Reduce fatigue, tiredness and other weak body conditions.•Central nervous system and brain cells regeneration. Prevent Alzheimer's disease.•Impove high blood pressure and other aging diseases.•Prevent stroke, myocardial infarction and heart attack.•Effectively delay menopause for at least 5-12 years via long term consumption.•Strengthen males’ reproducibility and enhance males’ sexual ability... and many more.•improve micro circulation andmaintain normal blood vessel functions. ST Factor is Different : A class of ots own. It is superior from other health care products, such as the common royal jelly, placenta extracts or vitamins. Its bioactive characteristics, ingredients structures, medication processes, scientific standards, purity level, concentration level and physiological absorption are solely exclusive, making it extremely unique in the market. As ST Factor is a superb absorbent of water, thus in order to maintain its 100% active ingredients, purity level and absence of chemical addictives or desiccant products, the manufacturing process is extremely complicated and delicate. As such, its production is limited. To-date, no other mafacturer is able to produce this unique product. ST Factor is manufactured using advance bio-technology and life science technology. This products contains premium royal jelly oil (2,100mg per tablet), which is significantlyhigher than other branded products from Germany and Japan. This 100% pure natural and exclusive active ingredients melt under the tongue. The 10-HDA's active level is 10 times higher than any competitors. This technology has won the gold medal of the 41st Brussel Eureka World Onvention Fair, the champion of hundreds competitive health care food manufacturers. Currently, it is the most prestigious branded products in Japan market. ST Factor is an exclusive youth essence, made from royal jelly colostrms for perfect health and beauty without any side effects. It complies strictly with GMP (Good Manufacturing Standards). * Consume by putting the tablet under the tongue (Sublingual Absorption). * Every tablet is air tight sealed. Use immediately after open to prevent the active ingredients from oxidation. •10-Hydroxy-2-decenoic Acid (10-HDA), a Major Fatty Acid from Royal Jelly, Inhibits VEGF-induced Angiogenesis in Human Umbilical Vein Endothelial Cells, Hiroshi Izuta1, Yuichi Chikaraishi, Masamitsu Shimazawa, and Hideaki Hara, Department of Biofunctional Evaluation, Laboratory of Molecular Pharmacology, Gifu Pharmaceutical University, Japan; Satoshi Mishima Nagaragawa Research Center, Japan.•Longevity in the Honeybee (Apis mellifera): Expression of Telomerase and Insulin Signaling Pathway Genes in Queen and Worker Bees, by Eli Hornstein, North Carolina School of Science and Mathematics.